Oil prices plunge to their lowest levels in over a year on Thursday, deepening a sell-off fueled by concerns about oversupply. The oil market falls along with equities after the U.S. Federal Reserve raises its benchmark interest rates. Bearish reports out of Asia overnight add to worries on both the supply and demand sides of the oil market ledger. U.S. West Texas Intermediate crude ended Thursday's session down $2.29, or 4.8 percent, at $45.88, the lowest closing price since July 2017. WTI is now down about 24 percent this year. "There's just a really negative narrative out there," said John Kilduff, founding partner at energy hedge fund Again Capital. "The stars are just aligned right now in a bearish way." In India, crude oil imports in November registered their biggest year-over-year decline in almost four years, Reuters reported. Meanwhile, Asian oil buyers reported robust purchases of Saudi crude in January after the kingdom cut prices into the region, according to S&P Global Platts. Oil recouped some of the losses through the morning, but dropped sharply around noon, mirroring a pullback in the stock market. The Dow Jones Industrial Average dropped more than 450 points as equities were buffeted by the U.S. Federal Reserve's decision to raise its benchmark interest rate on Wednesday. Crude futures have now fallen more than 35 percent from their 52-week highs in early October. The market is grappling with surging supply from the world's top three producers — the United States, Russia and Saudi Arabia — at a time when demand for oil is expected to grow less than previously expected. To prevent a price-crushing glut, OPEC and 10 other producers including Russia agreed earlier this month to remove 1.2 million barrels per day from the market. But the production cuts do not take effect until January, and the announcement has so far done little to stop the collapse in crude prices. OPEC Secretary General Mohammed Barkindo is now calling on the allied producers to publicly release their production levels, Reuters reported on Thursday. The producers did not disclose that detail during a press conference earlier this month, leaving the market to question how much oil production each country would cut. "In the interests of openness and transparency, and to support market sentiment and confidence, it is vital to make these production adjustments publicly available," Barkindo reportedly told OPEC members in the letter. Kilduff said the move shows OPEC is "grasping for straws" and "panicked" by selling in the oil market in recent days. "It just totally calls into question the sufficiency of these cuts," he said. "There's just huge skepticism around it." 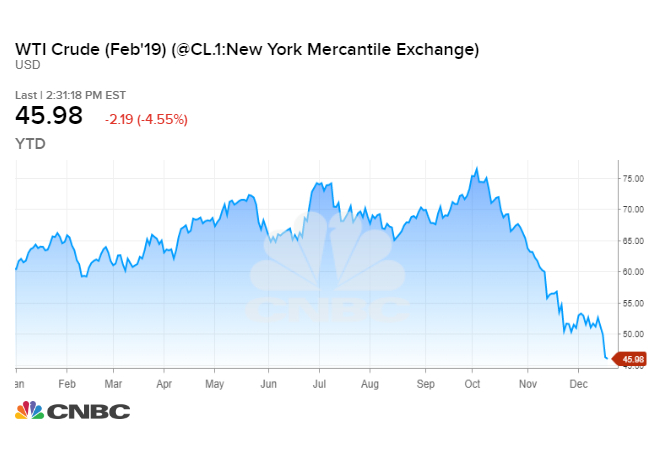 Meanwhile, the contango in the Brent futures curve in the coming months has strengthened this week, sending "a negative price signal," said Bob Yawger, energy futures strategist at Mizuho Securities. Contango occurs when the price of oil in the future is higher than the current price, creating an incentive to store crude. The opposite, backwardation, attracts investors because it makes it easy for them to yield a profit by rolling from one contract to another month after month. "Backwardation in the Feb/March was one of the few rays of hope in a sea of gloom in the past few days, but it went sour on Wednesday," Yawger said.